We’re quickly approaching the S finale, which means we need to get rid of all those pesky minions so the path to the Big Bad is nice and clear. In fact, go ahead and think of this as the clean-up week, since we’re also learning pertinent (tragic) backstories and restoring the ties between everyone’s favorite Doctor and her very favorite companion. Could this be the first step toward a team-up between our two gangs of roving Guardians? I sure do hope so. 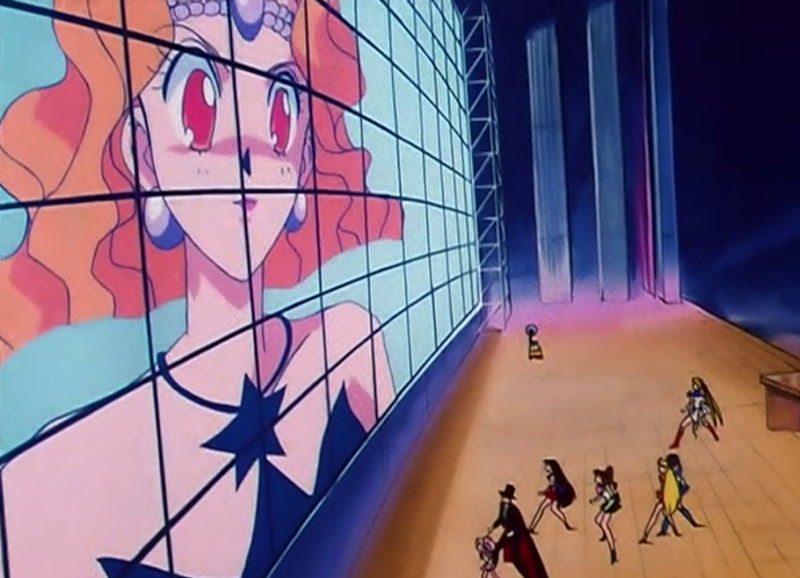 I miss hanging out with Haruka and Michiru almost as much as the scouts do. 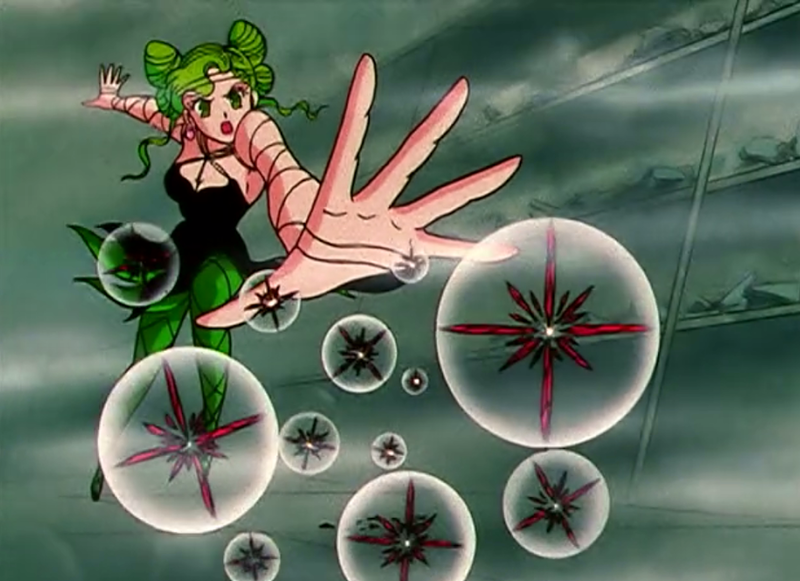 Chibiusa dashes to Hotaru’s house, but the whole place has been cleaned out and she’s nowhere to be found. Doctor Puu arrives to tell Chibs she’s sorry, so sorry, but Chibs is having none of it—she blames Puu for being mean to Hotaru and runs back home in the rain. She and Pluto find the Moonies gathered around Mamoru’s fancy-pants travelin’ computer as he uses this nifty new thing called “the Interwebs” to scan the academic society’s files for information on Professor Dad. We learn that “Tomoe Souichi” is a genetic engineer and professor at/founder of Mugen (“Infinite”) Academy—the same school that Hotaru and HaruMi currently attend. 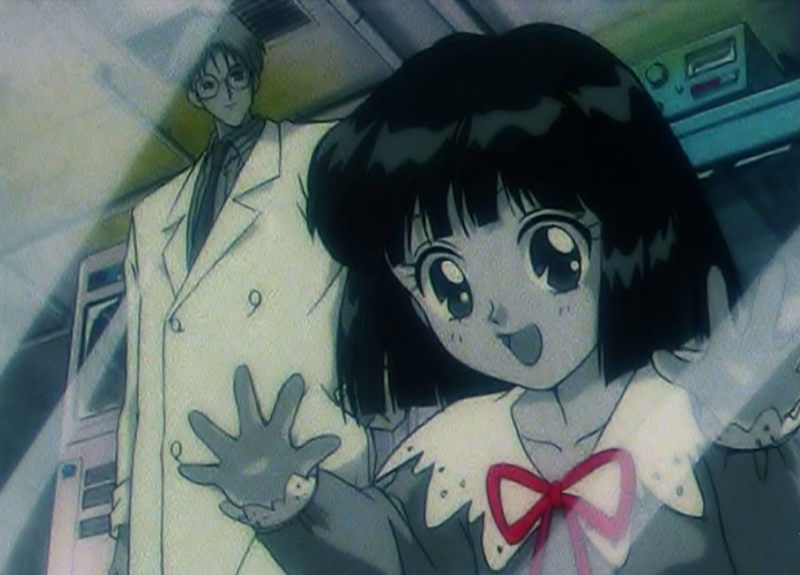 Dr. Asimov’s lecture takes place at Mugen Academy and is open to the public, so it’s the perfect time for everyone and their future mom to do some sneakin’, from HaruMi to Mimete to the whole Moonie gang. 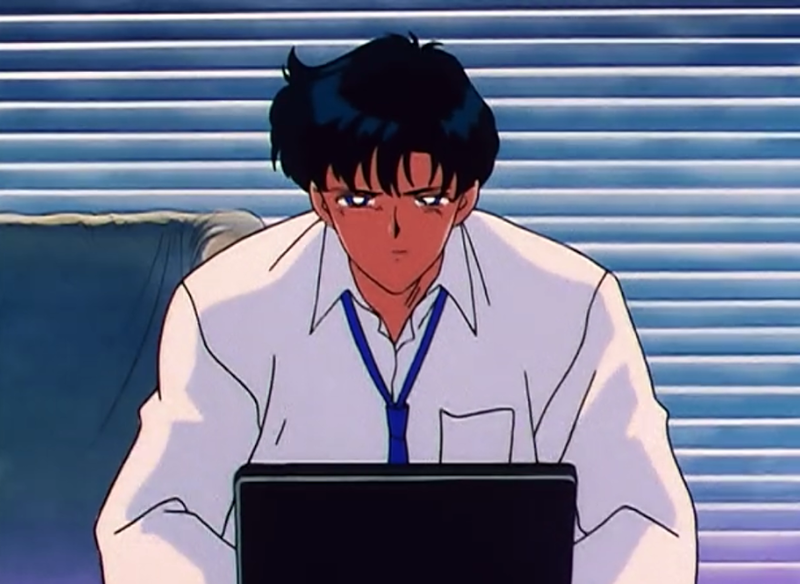 And meanwhile Mamoru’s back at home, hunkered over his laptop as he creates the world’s first Sailor Moon fan page. 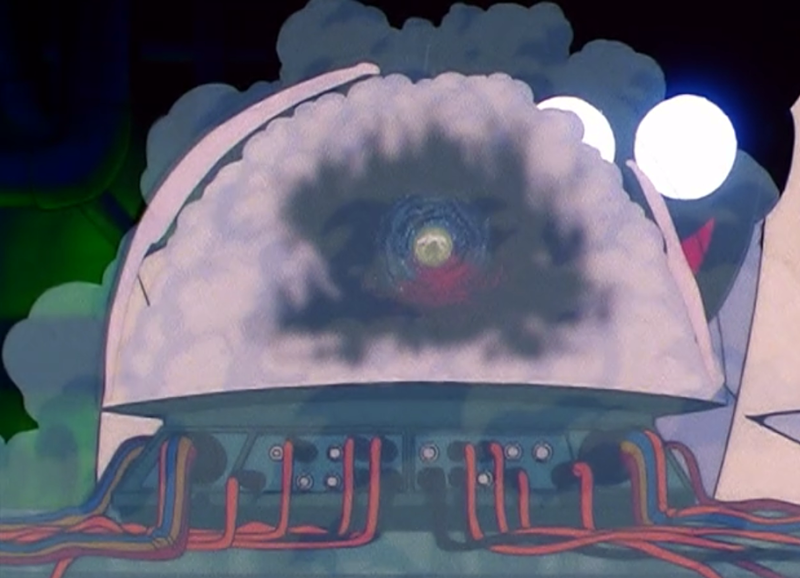 While he’s waiting the 90 seconds it takes his dial-up connection to save changes, he opens a second window and gathers even more helpful intel on Professor Dad: Four years ago (shortly before the founding of Mugen Academy), he and Hotaru were the sole survivors of a massive fire at a genetic engineering lab. Thank goodness no one has ever come out of a massive lab fire with evil superpowers. But then, no one else has been in a fire caused by a SENTIENT UNIVERSE. Er. Sort of? I’m a little unclear on the magical mechanics of what follows. What I know is, Dr. Asimov is going on about alternate dimensions and “a universe that may in itself be a life form,” and Professor Dad is cackling away about how his universe is going to devour ours, and then his fog machine slows down long enough to reveal that it’s actually the world’s most sinister snow globe. Oh no, my bad, that’s not fog at all—everyone in this universe is just a REALLY heavy smoker. Cut to four years ago, and That Fateful Day at Professor Dad’s lab when Hotaru came to visit and everything went to hell. 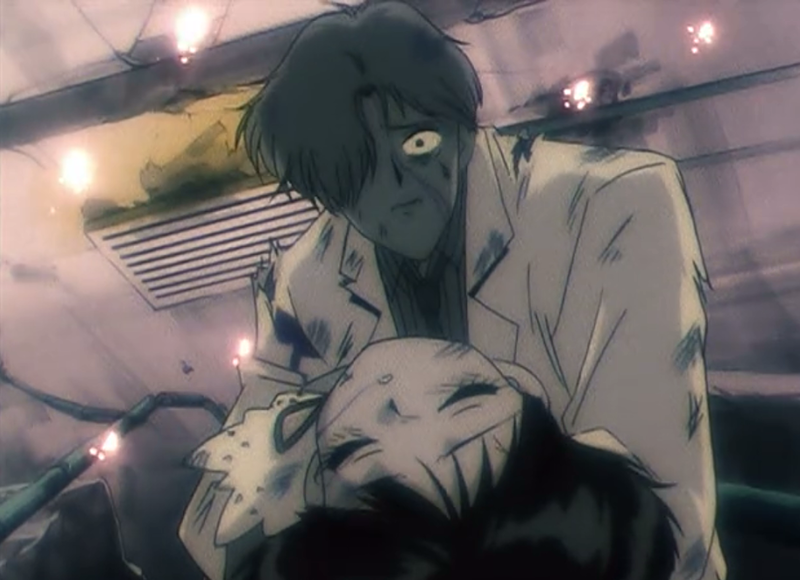 Their experiment backfired and exploded, killing everyone except Professor Dad, who could do nothing but hold the lifeless body of his daughter and beg for someone to save her and OH BOY, THERE GO MY FEELINGS. This is usually the part in the story where the devil shows up, and he does, except instead of the devil he’s a SENTIENT UNIVERSE. He offers to save Hotaru for the price of a body, and Professor Dad figures this is an equivalent exchange type thing and offers himself for whatever The ‘Verse has in mind, but as soon as he shakes on it The ‘Verse be like “Psyche!” and possesses both of them instead. Sad Dad becomes Mad Dad, Dolly takes up residence in Hotaru’s brainspace, and I am NOT okay with this turn of events. Sailor Moon had damn well better find a way to exorcise Sad Dad, or I will be VERY upset when this is all over. VERY. UPSET. Mimete’s dreams of making it to the big screen are truly 15 seconds of fame, as Tellu pulls the plug on her fellow Witch’s reality show. Alas, poor fangirl, we barely knew ye. So now Tellu’s in charge! (Don’t get attached.) She’s got a new plan in mind: Create a plant that will steal the heart of anyone nearby once it blooms, thus harvesting loads of hearts all at once. And they need those hearts real bad, ‘cause Dolly can’t fully awaken without ‘em. I feel you, girl. I’m useless in the mornings till I eat breakfast, too. The Prof’s almost as impatient as Dolly, so he decides to hedge his bets by also sending “Kaori” (who really is just the resurrected Kaolinite—man, the Prof must’ve spent a fortune on super glue putting all those little pieces of her together again) back into the field. She’s crushing on him rull hard and would much rather hang with him in the lab, but she’s only lower-level management, so all she can do is roll with it. Outside the Undercraft, Tellu’s selling “Tellun Flowers,” which don’t need food or water and are only 10 yen. They’re selling like hotcakes. Dammit, people of Juuban, did you learn NOTHING from last year’s Pet Shop of Horrors!? The nearby Doctor Puu hears all this and gets mighty suspicious, so she takes one home to investigate. No one will be surprised to learn that it’s super freaking evil and tries to steal her heart. (Sorry. Time Lord. Hearts.) Fortunately the Garnet Rod is there to protect her. Oh dear. I think I just added Steven Universe to my intricate Sailor Moon/Doctor Who crossover head-canon. You know who’s a whole lot more trusting than the good Doctor? 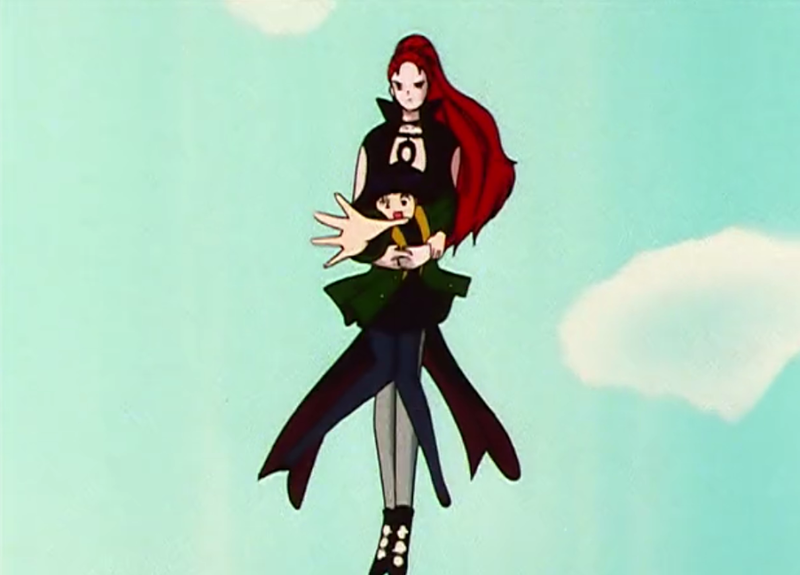 Hotaru, who’s finally shaken off Dolly’s hold and sneaked out to find Chibiusa. 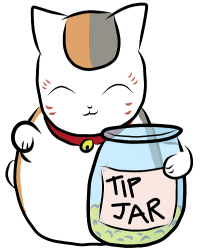 Along the way she runs into Tellu, who offers her the last plant of the day, and Hotaru figures it’ll make a good gift for her bestie. To the Tsukino house! Chibs is happy to see that her friend’s okay, but “okay” turns out to be a relative term here, as Hotaru pretty much immediately gets re-possessed by Dolly and almost chows down on Chibiusa’s heart. Hotaru wrestles back control and begs Chibs to help her, but before she can UGH, KAORI shows up to take her wayward little ward home. The two Bunnies can do nothing but stare in shock, although there’s not much time to do that, either, as Doctor Puu’s on her way over to tell them about the HOLY CRAP DEVIL FLOWER KILL IT WITH FIRE. 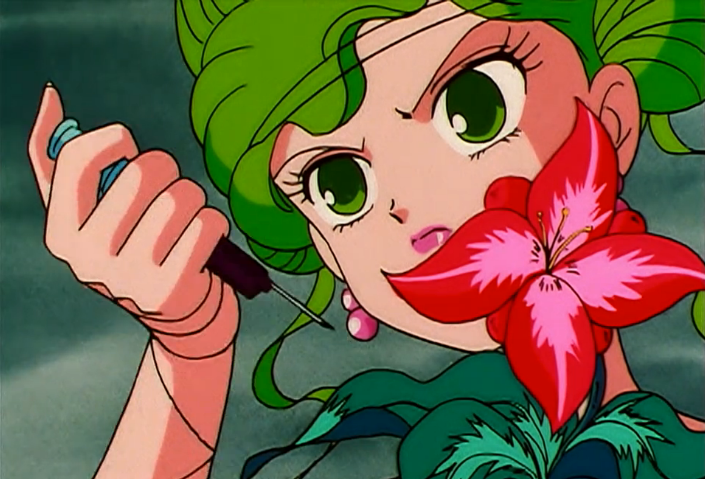 Pluto thinks Hotaru gave Chibs the demon plant on purpose, so Chibs, determined to prove her friend’s innocence, leads a crack team of investigators down to the flower shop. They’re timing is impeccable as always, because Tellu has just locked the doors and unleashed the blooming flowers on all her customers, stealing what is scientifically known as a “metric fuckton” of hearts in the process. It looks like two Moons, a Doc, and a surprise Tux (I know I should stop asking this but where did you even come from, dude?!) will be enough to take her down—until she starts shooting the plants up with ‘roids, anyway. Whereupon Tuxedo Mask goes into a gentlemanly furor about how fighting with flowers is totally his #brand. He slings a rose at the black ✩ star where Tellu had been keeping the stolen hearts, shattering it and releasing the hearts into the air. The superflower is so full of ‘roid rage that when it steals a heart, it self-destructs, and all these floating hearts have got it REALLY confused, so… it’s just gonna latch onto the first thing it sees and kaboom it, ‘kay? That thing happens to be a Tellu. I DID tell you not to get attached. I’d totally watch a webseries about Tuxedo Mask and Chibi Moon swooping around and beating up petty criminals with heart pellets. Just sayin’, Toei. 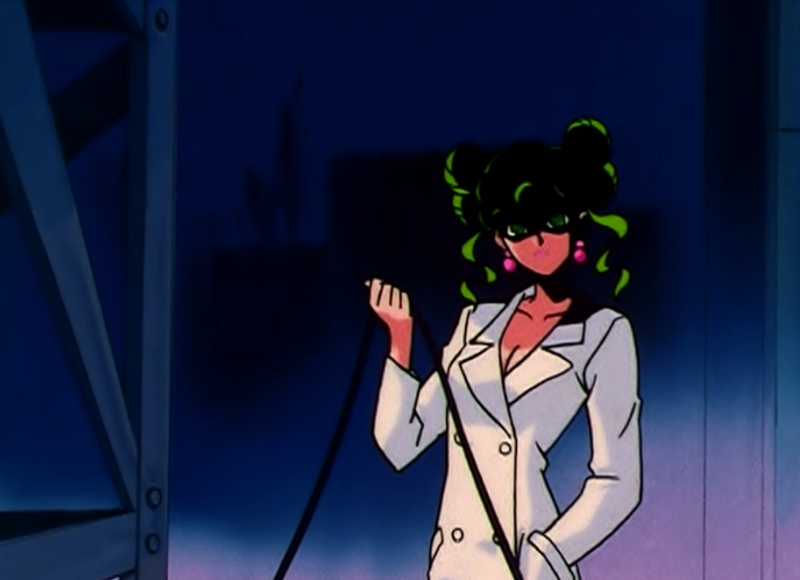 It’s worth noting that cutting the power to the TV didn’t kill Mimete, only “trapped her inside forever.” The next Mugen Academy guest lecturer is gonna be in for quite the surprise. On second thought, SENTIENT UNIVERSE. Maybe I shouldn’t think too hard about it. Yes, the Japanese language does in fact use the borrow word “mouse” (マウス; mausu) to refer to a computer mouse, so that Daimon’s weapon is bilingual pun gold. Hark! A plot point! The gang finds an ID on the smoking bits of Tellu’s corpse: Her real (former?) name was “Teruno Ruru,” and she was a student at Mugen Academy. Professor Dad, you have got some SERIOUS ‘splaining to do. You see, the bit about Tellu’s real name has to do with the origins of the witches which I don’t believe the anime ever explains. The daimons in the manga are very different from the daimons in the anime. 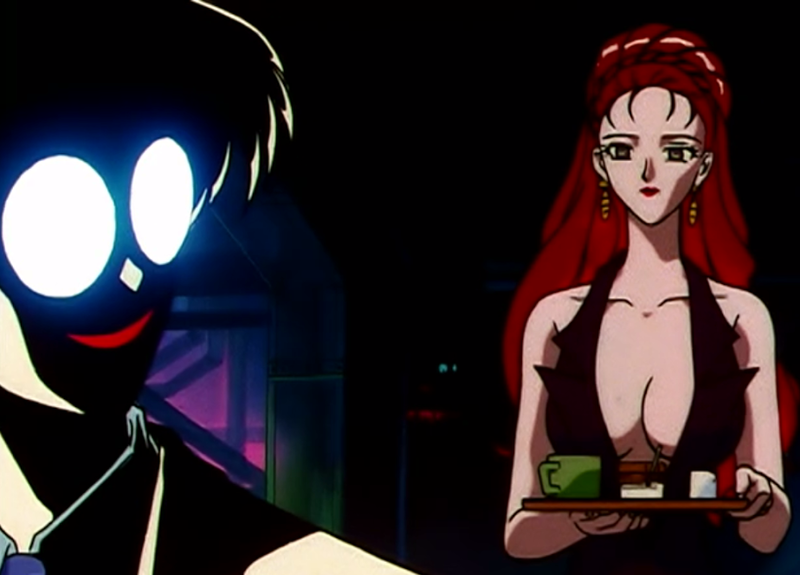 In the manga, the villains removed the souls of people (mostly students of Mugen Academy, but also animals like cats and dogs) and used their soulless bodies as vessels to implant daimon seeds. Most of the time it WENT HORRIBLY WRONG™ and created a mindless monster. Kaolinite and the witches are considered “perfect daimons”. Wow, that’s… super freaking creepy, actually. But also good to know! Thanks for sharing! Is Hotaru the saddest anime character ever? Abused, neglected, lonely, avoided, sickly, feared by even the other Outer Guardians who themselves are solitary, lonely warriors as well. Did Hotaru imply she’s always been sick? I know she had that “I never should have been born” line, but I just assumed that was just her being a sad goth girl. That’s totally a line from one of the poems she wrote in her dream diary. I’m not sure if she ever specifically said anything about being sickly her whole life, it was more a sense I got from the fairly casual way she handles it. “Just the usual seizure” sounds like something you’ve grown up with. Although, depending on how old she is, she may not have much of a memory of the time before her illness, I s’pose. Do we ever find out her exact age/grade? In my head she’s in her preteens, but I don’t think that’s ever been verified, and guessing ages in anime is tricky to say the least. Hotaru is 12. I’m honestly not even sure if that is even established in the anime, but it is in the manga.